Power chords, or “5” chords as they are often called, are an essential part of any rock guitarist’s arsenal. They are constructed of the 1st, 5th and 8th notes of the major scale, because the 8th note in a scale is the same as the 1st, just an octave higher. In fact, it’s often called “the octave” instead of the 8th. A power chord only contains two different notes, unlike a major or minor chord, which contains three. The third note in a chord dictates whether it is major or minor. Because a power chord has no third, it is therefore neither major nor minor. This gives the chord its raw and powerful characteristics. The late Link Wray (1929 – 2005) is credited for inventing power chords. He found that when adding distortion to a major or minor chord a dissonant sound was produced, by removing the 3rd the dissonance was lost with the chord still maintaining its diatonic functionality. Below are sets of exercises that consolidate all the information covered so far and assist in improving orientation along the two strings. 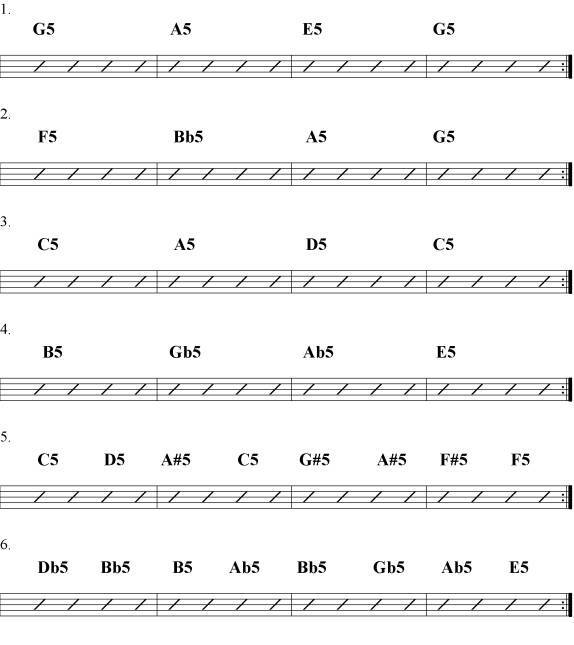 Start by trying all the exercises on the 6th string. 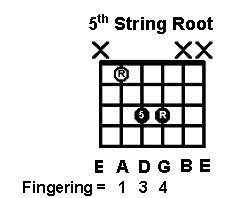 As soon as there is little hesitation when changing from chord to chord try the exercises on the 5th string. With the shapes learnt and the strings explored its time to put everything together. Below are some songs using Power chords, hopefully something for everyone. Power chords are usually played with down strokes, this helps co-ordination making it easier to strike just three strings, it keeps the right hand in the same position allowing it to be used to mute unwanted strings or apply palm muting. I hope this article has been of interest. 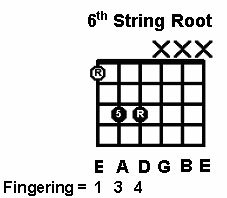 There is a lot here to get your head around so take it slowly, just by knowing how the notes progress up a string (remembering that E and B do not have sharps) it is now possible to work out any note on the guitar. And that’s something many players cannot do! Paul Andrews has been playing guitar for over thirteen years and teaching for seven. Paul also runs a successful teaching studio in the South of England teaching over 100 students a week. He has written a new book "Learn to Play Electric Guitar" which you can find at his website Paul Andrews Guitar Tuition.